Spacious Loft-Living in the Heart of Downtown Savannah on Broughton Street! Get ready for loft living in the heart of Savannah when you stay at Midtown Pointe. Southern charm meets trendy city life at this fresh, stylish property. Exposed brick walls, an open layout and tons of natural light make this space feel like a breath of fresh air. Midtown Pointe features 1,100 square feet of space and sleeping space for up to six guests. The property has one king bedroom, one queen bedroom and two full bathrooms. Midtown Pointe is conveniently located right in the heart of beautiful Savannah on Broughton Street. Check out what this home has to offer if you're looking for Savannah vacation rentals near Ellis Square. This is one of the vacation rentals Savannah GA visitors dream about! Midtown Pointe's open layout makes it a very friendly, inviting place to gather. The property's state-of-the-art kitchen features new gray cabinets, new countertops and new appliances. Guests can make use of a refrigerator, dishwasher, oven and microwave. A center island with a sink and seating for six is the jewel of the kitchen. Pendant lighting and power outlets on the island ensure that you'll have the perfect space for whipping up some meals while you're in town. Little details like subway-tile backsplash and crystal knobs give this kitchen a magazine-ready feel. The kitchen area opens up to a very soothing, comfortable living room. Modern sofas and a flat-screen television are arranged to allow for maximum relaxation. Gleaming hardwood floors are featured throughout this home. Making your way to the bedrooms inside Midtown Pointe is an exercise in good living. These beautifully designed, minimalist bedrooms provide everything you need to enjoy a great night of sleep. Get cozy while surrounded by exposed brick and a large window in the home's first bedroom. This room features a four-poster bed, a dresser, night tables, built-in cabinetry and a ceiling fan. There is also a flat-screen television for your enjoyment. A bathroom with a walk-in shower is attached to this bedroom. This bathroom has been fully updated to feature new cabinets, dual sinks and gorgeous tile. The property's second bedroom also features exposed brick walls and a flat-screen television. Guests can make use of a night table and dresser. A second beautiful, fully updated bathroom with a shower bathtub combo is accessed from the hall. Midtown Pointe isn't just a property that looks amazing. This home delivers when it comes to the amenities that can make your visit easier and more comfortable. The home features a washer and dryer right off the main living area. In addition, guests can make use of a queen-sized air mattress to create more sleeping space in a snap. A drip coffee maker is waiting in the kitchen to help you get caffeinated before heading out into beautiful Savannah every morning. Wi-Fi and cable are also included. The building that houses Midtown Pointe features an elevator. It's easy enough to fall in love with Midtown Point simply by looking at its beautiful layout and design. However, there is so much more to love about this place when you look a little bit deeper. Midtown Point is located right next to Ellis Square. This detail alone makes it one of the top Savannah vacation rentals you can pick. Ellis Square is considered by many to be one of the best spots in Savannah. This lovely urban square is filled with fountains of shooting water that kids love to splash in. In addition, the landmark is known for its life-sized chess set and shaded picnic tables. Midtown Pointe is one of the best vacation rentals Savannah GA visitors can consider while they're building their itineraries. That's because this home places you next to so many amazing and iconic attractions within the city. You will be in the heart on Savannah on beautiful Broughton Street when you step outside your door. Broughton Street is lined with some amazing shops and restaurants that are perfect for those times when you just want to wander around for a bit. Famous Leopold's Ice Cream is located right on Broughton Street. That means a few sweet scoops are definitely in your future when you scoop up one of the best Savannah vacation homes around! The Lucas Theatre is also situated on Broughton Street. In addition, the Savannah College of Art and Design's Gutstein Gallery is located here. You will also have the rest of Savannah beyond Broughton Street to explore when you have one of the top Savannah vacation rentals to call your own during your stay. What are the must-see Savannah attractions? Tour the architecture and oak-lined streets of the Savannah Historic District at your own pace. You will fall in love with the beautiful facades and porches here. It's also important to pencil in some time to enjoy iconic Forsyth Park. The greenery, statues and fountains inside this gem will not soon be forgotten. River Street is the place to be if you're looking for some great restaurants, bars and pubs near the water. The list of essential Savannah attractions also includes the Cathedral of Saint John the Baptist, Bonaventure Cemetery, Mercer Williams House Museum, Chippewa Square, the Georgia State Railroad Museum, City Market and Skidaway Island State Park. Don't forget about the spooky guided tours that happen once the sun goes down over Savannah. In addition, events like the Savannah Music Festival, the Savannah Craft Brew Fest, the Savannah Holiday Tour of Homes and the Savannah Music Festival will keep you busy. 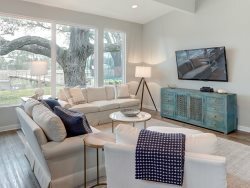 Make your visit to Savannah spectacular by booking one of the vacation rentals Savannah GA guests can easily fall in love with. Midtown Pointe offers a contemporary vibe with a twist that truly embodies Savannah's historic charm. This property offers the modern features and desirable location everyone wants. Book your slice of loft living with Southern charm today!